Although the Jewish calendar marks Tishrei the first month of the year, some sources actually refer to the Virgo month as the seventh one. The word for seven in Hebrew is 'shevah' which is similar to the word 'sovah,' plentiful. Thus is our reason for calling Tishrei a time for reaping plentitude. Just as we harvest our produce during Autumn so to we are gathering mitzvot to keep us satiated and insulated throughout the cold winter months. No month is as blessed with mitzvot (commandments) as the month of Tishrei (mid September to the beginning of October). On the first of Tishrei we celebrate Rosh haShana and the hailing of a new year. On the solar calendar, the festive night of New Years is the evening prior to January 1. People look forward to the idea of starting over with a fresh slate and making spur of the moment new years resolutions. Rosh haShana, on the other hand marks the time period to which the entirety of the previous month, Elul, is dedicated; people await Rosh haShana with trepidation because it doubles as the Yom haDin (Day of Judgment). On this day "the king [G-d] sits on the throne of judgment and the books of life and death are open before him..." (tractate rosh hashana). For this reason Yom haDin is also referred to as Yom haKeseh - the Day of Concealment. Usually, the Jewish festivals fall out when the moon is either full or almost full (mid month). Yet, Rosh Hashana is celebrated when the moon is a sliver no bigger than the length of one's finger nail since the new moon has not yet made its appearance. In the same vein, Bnei Yisrael (the Jews) are likened to the moon. Regarding the Sabbath and other Jewish holidays, the glow of our nation lights up the world like a full moon shines down on a dark road at night. However, on Rosh haShana, we diminish our light so that the attention of the day can be entirely focused on G-d's Sovereignty. Moreover, we are hoping that G-d will inscribe us in the book of life and sentence us to a year full of sweetness. Therefore, by concealing ourselves, we pray that Hashem [G-d] will ignore our sins and bring us close to Him. Following swiftly on the New Year's heels is Yom Kippur, the day of Repentance. On Yom Kippur, tens days after Rosh haShana, we dress in white, abstain from eating and drinking so we can be able to concentrate on our prayers without distraction. On this day we are given the status of angels. 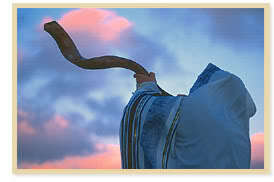 During Rosh haShana people bless one another, "May you be inscribed and sealed in the book of life." On Yom Kippur, however, the stakes are raised and this time people cut the phrase short, "May you be sealed in the book of life." We're not dealing with small potatoes here. Our lives are hanging in the balance. One prayer we say on Yom Kippur, the unetanneh tokef, sums up the mood of the day quite well. "Who will live and who will die...? this one by fire and this one by water etc. etc." One might think people would be ready for prozac by the end of Yo Kippur but, in fact, the day is meant to be a time of great rejoicing. The closeness that we wanted with Hashem on Rosh haShana is achieved on Yom Kippur. Our sins are forgiven and we can pass into the next year pure as the day we were born. The moment Yom Kippur prayers are concluded, the men head home, grab a bite to eat, grab some wooden boards and they head out to build a sukkah (booth) for Sukkot. The sukkah symbolizes two things: the clouds of glory that G-d surrounded us with in the days following our Exodus from Egypt, and it is a symbol for this world. Just like G-d protected us in the desert, so to will He protect us from the elements and wild animals during sukkot while we live in our temporary dwelling. That's right, we move out of our comfortable homes into little wooden huts for the space of a week. We pray, eat, sleep and learn Torah there. We put a lot of work into ourselves and our relationship with G-d over Rosh haShana and Yom Kippur, it would make sense that we'd reach a holiday wholly dedicated to dwelling explicitly with Hashem in this world for the Sukkah stands as a symbol for this world and we consciously use it only for mitzvot. May we merit to allow the energy of Tishrei to spill into all the other months the year.